We begin the Mega Marathon with Proteinicious dishes, and for ease of cataloguing and cooking, I have 2-3 major themes. Without divulging further details, this week (today and tomorrow), we have Condiments made with Protein as a star. It would be amiss if I didn't mention that my family loved all the dishes made for this BM. I did have some elaborate ones, and some quick dishes too. Most of my dishes this Mega Marathon are also Gluten Free and Vegan. I had shortlisted and started cooking based on that theme too, but midway accommodated some non-vegan protein sources that my family, especially those that my kids prefer. Else, most dishes / ingredients are plant-based and I have indicated suitable substitutes wherever possible. I haven't gone 100% vegan at home, but the shift to plant-based food is slowly happening. Till that time, do take out a few minutes, and enjoy the spread over the next 30 days (Sundays being an off, we have 26 dishes in all). 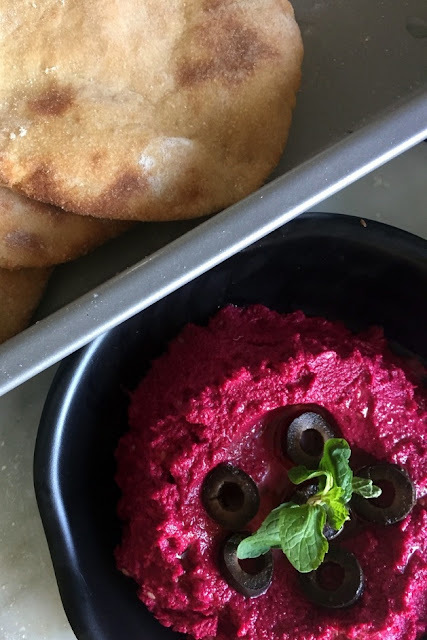 Today we begin with Beetroot Hummus - a delicious #vegan and #GF dip that goes with well, pita. But so it does with anything like toasted Bread, Veg Crudités, or even Chapati. I have seen this used as a topping for mini pizzas too - so thats a great idea. The colour is totally attractive to kids and adults alike, so it might be your next favourite dip ! Cooked Chickpeas - 1.5 cups (if using canned, drain and use) - peel the cooked chickpeas / Kabuli channa if desired . In a large blender / food processor, first blend the chickpeas with beetroot. Slowly add the salt, spices, tahini, aquafaba and blend well. Add Olive Oil 1 TBSP at a time and blend slowly in spurts till you get a creamy texture. Adjust salt and spices and one last run , blend with the lemon juice. You may increase / decrease any of these ingredients. Some versions also use roasted beets, so you could do the same - the smokiness may not appeal to all. Add more lemon juice / Olive oil if required. Use a dry spoon every time to increase shelf life. Hummus is such a versatile dip! we love all avtars of this dip and must say the beetroot lends it such a vibrant color, not to forget some nutrition too. Great choice for the theme. Such a colourful hummus. I love the earthly flavour beets renders to a dish. This one must be quite flavourful..
Now this is one Avatar of hummus that I need to try.looks yum kalyani. Think of protein rich dishes and hummus comes number one on the list. 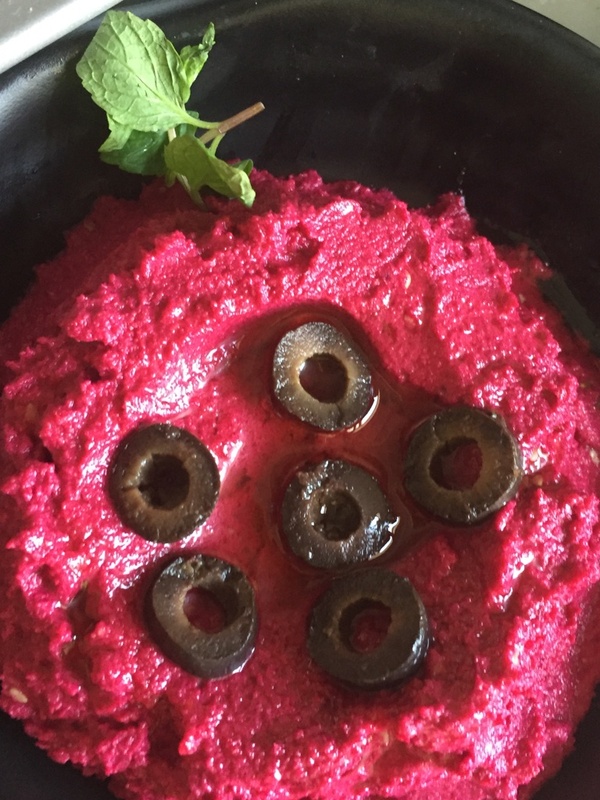 Love the bright beet color of this dip and can have it anytime a day. Very nice kick start for the marathon. I love how bright that hummus looks Kalyani. Wow with so many promised gluten free and vegan, this is going to be exciting series!.. Love that vibrant color. It is surely a party pleaser. Coming to that 100% vegan thingy, I know its quite hard huh? What a brilliant color Kalyani! Makes it all the more appealing to kids and adults as well. 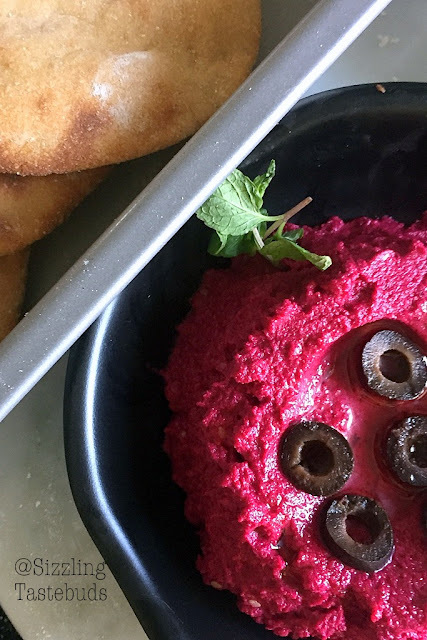 Hummus with anything is definitely my favourite, and this gluten free dip will surely please my tastebuds. Wat a vibrant dip. Kalyani I've come across beetroot hummus on various blogs and though I loved the color was a bit skeptical as to how it would taste. Then a visit to a Syrian restaurant and we ordered hummus. They served us beetroot hummus and I loved it. Its so delicious that I even used it as a sandwich spread when I made it at home. Such a vibrant colored hummus,sounds healthy.Looking forward to your recipes. Such a vibrant colored hummus. Would love to spread it on a bread now and have it immediately. Looking forward to your other recipes.